Ah, T.S. You always say it perfectly. Well, I have a mere 71 pages left in my own revision, and I thought I’d share a few items of interest. First, I cannot believe I sent this novel out to agents in its previous form. No wonder I haven’t gotten anywhere. Some of these cringe-worthy mistakes were mere fumbles, some were over- or under-written scenes that needed more attention, and some were just plain bad writing that needed to disappear. And yet—and yet. I did find myself reading through some long segments this time without changing a thing. Hmm. That was different. And the scenes themselves seem more grounded in reality. These people are interacting in real rooms with their own smells and shadows and noise. They’re tasting real food, driving down streets and pointing out detailed sights along the way. And they are deeper for it. At least I hope. Their backgrounds have been more thoroughly explored and the motives for their actions are more believable. The story coming to life on the page has been a long, hard haul. But not long enough, I fear. I once wrote a short story I revised literally hundreds of times and finally published it 10 years later. Ten years! For a short story! I don’t know why I thought getting a 300+ page novel into publishable shape would be any easier. I hope I’m not still, as this article says, “rearranging deck chairs on the Titanic.” I hope you’re not either. How goes it out there? Any similar—or wildly dissimilar—experiences to share? Do you find major mistakes or surprising beauty when you revise? Wishing all of you luck and inspiration. And a lovely toast and tea. 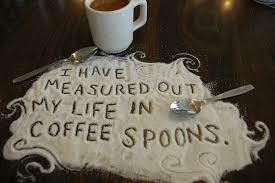 Or coffee, if that’s more your thing. I revise as I go–and then do a major revision at the end. But for me it works. Congratulations on your progress and I hope you continue to enjoy the journey.